Fluorescence has long been used to measure a range of water quality parameters, from chlorophyll and algae to hydrocarbons and optical brightening agents. 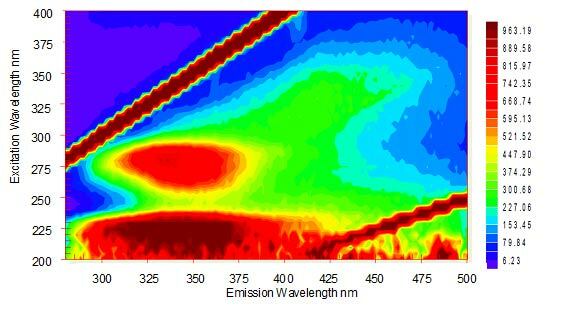 Recent advances in LED technology have led to the development of portable, submersible fluorimeters that can look further than ever before into the ultra-violet regionwith some very interesting results allowing users to measure Biological Oxygen Demand (BOD) and Dissolved Organic Matter (DOM). Fluorometers have been used for many years in the field of water quality monitoring and are the established and trusted technique for reliably measuring dissolved organic matter, chlorophyll and algae. Fluorometers work by emitting light at one wavelength and detecting light emitted by the target at another wavelength. Only certain substances exhibit this property and at very specific pairs of wavelengths, this means that fluorescence can be a very selective and sensitive optical technique. DOM is made up of decaying animal or vegetable matter. In many cases DOM in a water body will also be accompanied by an active microbial community. It is this microbial community that consumes oxygen leading to high levels of biological oxygen demand (BOD) and the subsequent crashes in oxygen levels that can be so devastating to aquatic ecosystems. Proteins found in the cell walls of these micro-organisms have been shown to fluoresce in the same region as the amino-acid, Tryptophan. ‘Tryptophan-like’ fluorescence (TLF) can be used as a measure of the microbial activity within a water body and therefore as an indicator of Biological Oxygen Demand (BOD)(Hudson et al. 2008). Common sources of polluting DOM such as silage liquor, cattle and pig slurries and human sewerage all fluoresce when excited at the same short ultra violet wavelengths (~280nm)(Baker et al. 2004). This means that fluorimeters ‘tuned’ to this wavelength could be a uniquely useful tool for a wide range of monitoring applications in both rural and urban catchments. Measuring Tlf gives a direct measure of the potential for DOM in the watercourse to cause harmful oxygen crashes, in the same way as the Biological Oxygen (BOD) 5-day test - but of course results are available instantly. This allows potential problems to be identified much earlier and for the sources of polluting DOM to be identified more quickly and with more certainty. The original research that identified the different constituents of the fluorescence EEM (as shown above) was carried out in the laboratory using a sophisticated bench-top scanning fluorometer. Once the specific excitation and emission wavelengths of the Tryptophan-like peak were identified then lower cost portable instruments could be developed that focused solely on that excitation/emission pair (280nm/340nm).Due to the short wavelengths required to provide the correct excitation, high power xenon flash lamps were used as the source in early portable Tryptophan-like fluorometers. This meant that they could not be submerged - instead the sample was introduced via a quartz cuvette, and that they were still relatively large and expensive. The breakthrough recently occurred when light emitting diodes (LED) were developed that could attain the short wavelengths required. This now means that compact, submersible fluorimeters tuned specifically for TLF can be produced in the same format as established sensors for chlorophyll, algae or optical brightening agents (OBA). 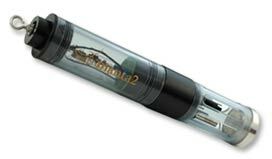 For the first time, robust and submersible Tryptophan-like fluorimeters can now be deployed alongside the flexible Manta2 multi-sonde platform from Eureka. This opens up a whole new range of applications for exploiting the power of this novel technique. As the Manta2 sonde can incorporate up to 12 sensoAArs it will enable traditional determinands such as dissolved oxygen, pH and turbidity to be measured continuously alongside Tryptophan-like fluorescence. This will give a clearer picture of the impacts of polluting organic matter on the health of a water body, as well as a much better understanding of the relationships between DOM and more conventional parameters. The robustness, ease-of-use and comparative low cost of the submersible platforms take TLF out of the hands of expert researchers and academics and into the hands of environmental practitioners with a limited level of technical expertise. The Manta2 platform is easily interfaced to the Adcon wireless telemetry system - so that fluorescence data - alongside other parameters - can be collected remotely and in near real-time. The power and flexibility of the Adcon system and web based FlowView interface enables automatic water samplers and other devices to be triggered according to pre-determined levels of any parameter in the system. Whether you are trying to retrieve data from that all-important, but remote, one-off site, or building a sophisticated monitoring network for catchment scale monitoring or research, then you need look no further than the Tryptophan fluorimeter in tandem with the Manta2 sonde and Adcon wireless telemetry system. The first Tryptophan-like fluorometer has recently been fitted to a Eureka Manta2 sonde alongside sensors for temperature, optical dissolved oxygen, pH, oxidisation reduction potential (ORP), conductivity and depth. RS Hydro will be conducting trials with this exciting sensor package in the coming weeks. If you are interested in the results, or if you have an application for which Tryptophan-like fluorescence might be the answer then please contact RS Hydro and we’ll be pleased to help.